UX Design and strategy aren’t just job titles, it is a system of thinking about solving problems in life. Applying my tool kit as a user experience designer and strategist I was abled to navigate my wedding. In this case study, I will be analyzing one piece of my wedding—my hand crafted pinwheels. After reading too many bridal magazines, the image of a pinwheel became locked in my mind as being a great wedding favor—something that was fun and different. After I decided on pinwheels I went about making over 130 of them even enlisting friends and family to feed into my madness. But then I had a awkward situation arise, where do the pinwheels live? How do I make sure that each person gets a pinwheel? I also realized at the venue I would have a limited amount of time to set anything up. The first thing that needed to be done was getting a sense of the actual users i.e. our guests. We had 120 confirmed guests. Our guests age ranges from 7 to 75 years old and the lay-out of our space, the way that our guests would be coming in and interacting with these pinwheels needed to be considered as well. After looking at the floor plan of the venue and breaking our guests into different age group categories and identifying their particular needs, I set about researching how other brides had approached their pinwheel situations. I looked at various craft sites and Pinterest for potential solutions to how I could properly integrate my pinwheels into my wedding. For my prototype tests I tried to test with different people who fit into the different user personas/trends that we found in our user research. I used my grandparents, my parents, my maid of honor, husband and any spare niece or nephew that was around. Several other examples from Pinterest and other craft sites had some version of a ribbon with pinwheels pinned to it example. 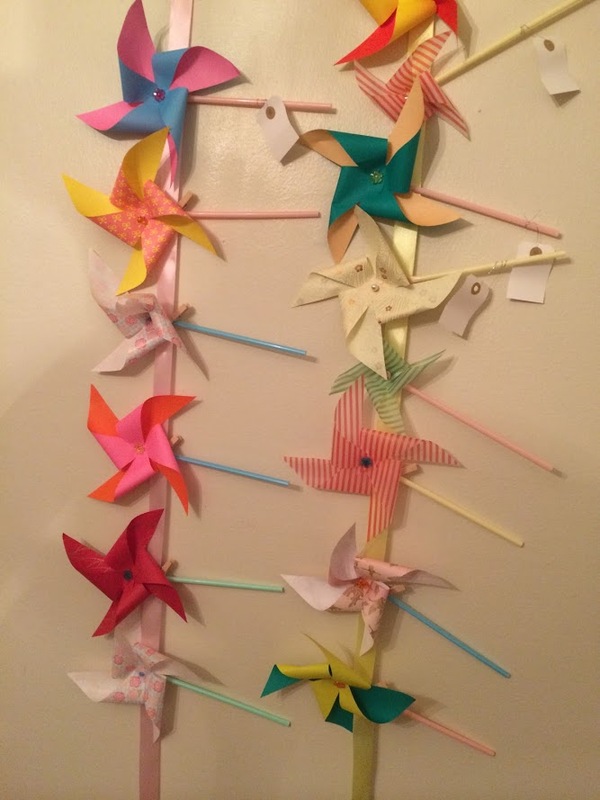 I did several test examples and every time my test subjects (the youngest of my wedding guest 7 years old and my husband) would end up ripping the entire thing off the wall and pinwheels would end up everywhere. It was a disaster. I tried a variation I had seen of lining the pinwheels up on a floral foam core in rows making them stand up on end. While it looked adorable in my prototypes as soon as I actually interacted with it and did some user testing with a group of people, I saw issues. Having the pinwheels close together would cause back-up while people waited for others to find their pinwheel and get to their seats. Also, the spacing became a issue and pretty soon the materials started o fall apart after a few runs of actually being interacted with. I went to a dollar store and bought a bunch of different materials to attempt having the pinwheel stand on it’s own. The first test I did worked perfectly! However, following the scientific method (remember that from middle school science class?) I had to replicate my success. When I tried to replicate it 10 times, all of the other tests failed to hold the pinwheel up. This did; however, lead me closer to my ultimate solution. The freedom to fail is very important in any design process and even “failures” are valuable. From this iteration, I had the light but moment of putting the pinwheels on the tables instead of making people come and get them first! My initial hypothesis for my pinwheels was to use them as a seat indicator. Our guests would get their fun pinwheel, find their seat and have their pinwheel to play with. However, after doing several test runs of this hypothesis, I quickly saw how it fell apart. No one wanted to hold onto the pinwheel while waiting for their seat and having the pinwheel as a seat number indicator caused traffic problems specifically around the collection area which would become a bottleneck. Finally, rather than having the pinwheels need to be actively take from a place, I created the idea of using a single sheet of paper as a card. A card tent which would hold the pinwheel while also having the name of the guest was the final solution I arrived upon. After several tests, a solution was reached which allowed me to use my original requirement (my hand crafted pinwheels) while also serving a purpose.